From time to time an unsolicited redesign pops up and receives a lot of attention. This time it was Fred Nerby’s take on Facebook’s look and concept. Unsolicited redesigns are a new look on something familiar and they seem to be an interesting experiment or exercise for the designers creating them. That is great. On the other hand they are completely based on assumptions. They are missing a basic building block of good design – understanding the needs of a client. 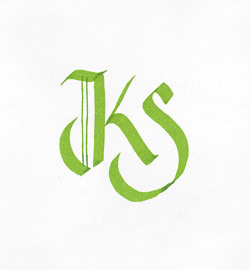 That is something a designer gains by direct communication with his client. It is like telling someone you barely know, that they should change their haircut. Brandon Harris said this well in Quora thread about Wikipedia: What does the Wikipedia community think of “The Wikipedia Redefined” concept? I know, authors of unsolicited redesigns usually don’t explicitly say that the target of their redesign has to consider the new concept. The problem I see there is that they don’t say anything at all on this topic and silently wait what will happen. Thinking that my skills aren’t good enough to make my idea happen, being afraid to start a new project, not trying often enough, being afraid to talk to people I admire — these are things that happen too often to me. Well, they actually, don’t just ‘happen to me’. It’s my way of looking at world, my fear. Recently I started with little things — when ordering food at a restaurant I often choose things I have no idea what they are or I alter my how I go to the office. Suddenly talking to people I don’t know got easier as well, I find it a bit easier to start on projects that include lot of things I have no experience with. It feels great and as a bonus I’ve discovered lots of new things to eat! More than 2 years ago I started my 365 ideas project. I made a brave decision to create one collage every day for a year (I know!). I wanted to commit to doing creative work regularly again. I had been attending afternoon art classes since I was kid until the age of 20 – expressing myself visually has always been part of me. After finishing art classes, I had bursts of creativity, but with time they almost vanished. 365 ideas project was a way to defeat my growing fear of starting something new. 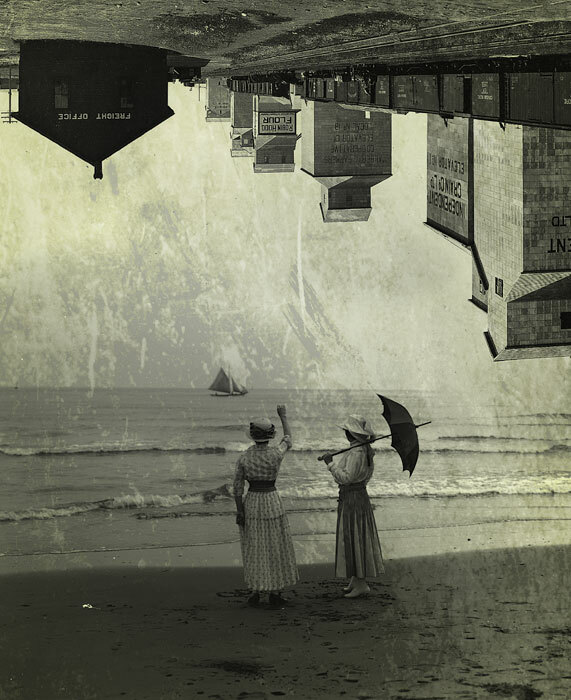 The rules were simple – create one collage every day, don’t spend too much time on it, publish it. Even though creating the first few images was painful, 365 ideas became a habit. During my days I collected and sketched ideas I could use in the evenings. This went well for around three months, then I started to feel exhausted and had to slow down a bit. Having a day job as a front-end developer and doing this in the evenings, I had a lot on my mind and schedule. With summer 2010 approaching I started to notice my stomach doesn’t feel right and examination in the hospital revealed I am very close to developing stomach ulcers. It was clear that 365 ideas was too big to continue with. But I am a tough person, I still wanted to carry on with it, so again I lowered the frequency of creating my collages. I was gradually getting further and further from a daily project. Also my aproach to the images started to feel different – I was already thinking about smaller series and didn’t even feel the need to create them that often. At the moment I create approx. one image per month and I am already doing something different than what I (vaguely) defined in the beginning. I feel like I need to go on with different approach and 365 ideas starts to feel like a burden. I’ve learned a lot by doing this: I have my own creative process, I collect my ideas, I know that personal projects are worth it. The mistakes are also clear: I wasn’t specific enough about what I want to do in 365 ideas project, I should have defined more rules and think about my time more carefully – I might write a separate blog post about this later. There were a lot of mistakes in 365 ideas project, but it was a much needed kick and it was the best badly planned project I’ve ever made. Writing more about what I do is one of my goals for this year and trust me, it wasn’t a pleasant surprise when I realized it’s already March and I have written only one article (and a half) on my blog and two little texts for WORN magazine. But well, it’s better to simply accept that and continue with better attitude. So let’s open merriam-webster.com and overview of English tenses and back to work (by the way, Merriam-Webster has a great Android app). Blogs are great platform for reflecting yours and other peoples thoughts. Also advanced discussions happen between articles on different blogs. They are often sparks for greater things, like shifts in thinking about web/creating web. Formulating your thoughts is also very good for you. Writing down what you’re thinking about shapes your ideas and opinions, makes you verify your points and be consistent. At least ideally, in the world of rainbows and unicorns where some people think I live. This post is my way of joining the initiative created by Chris Shiflett to encourage blogging. Don’t hesitate to add your bit! The Manual is published three times a year and contains six texts and six lessons all written by people from the web industry. It attempts to widen our thinking about what we do. 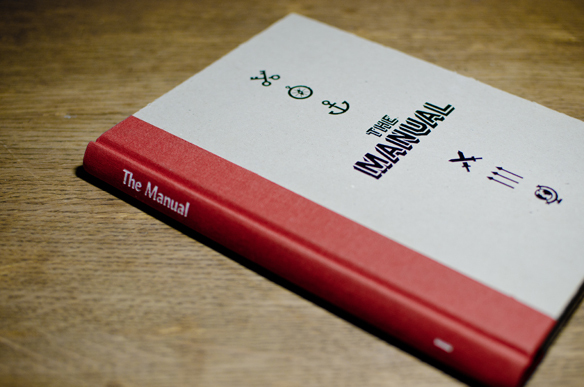 As publisher Andy McMillan puts it – The Manual is not about how, it focuses on why. The Manual is awesome. Here is what the first issue is about. In first text Simon Collison touches a topic that I am trying to sort out for myself at the moment – how to choose well what to be interested in even though one likes a lot of things. But trying to nourish all interests just seems to lead to mediocre skills and knowledge. Simon Collison suggests we should determine our strengths and values, which should help to point us in the right direction when choosing what to do. Next step would be following the attitude of a craftsman. If you are interested in web design as a craftsmanship, watch this talk Simon Collison gave at Build conference last year. In “The Space between You & Me” Frank Chimero looks at the web as a reflection of peoples needs and desires, as our mirror. “It’s people all the way down,” he says. * Free idea: a web design gallery that also includes description of the creative process and decisions taken. Another strong idea Jon Tan comes with is thinking about web designers as “80 percenters”. These are people who master 80% of different disciplines which adds up to 100% needed to create a website. I personally like this idea, being person that creates design and front-end, whatever disciplines that includes. There is one thing I don’t understand though – why do most job postings from digital agencies pretend that everyone is specialized in one technical field and that’s it. Being Jack of all trades isn’t good for everyone, but a blend of reasonable amount of disciplines in one person could have great added value. I asked about this on Quora. Dan Rubin reminds us of how much is the web still influenced by concepts originating in print. He says this connection isn’t usually well considered and causes lots of misconceptions, eg. concept of “the page”. He calls this situation identity crisis in which we still struggle naming and defining things specifically for the web (like our job titles). Liz Danzico talks about how is the public changed by social media, people having many little identities on their social media. She says we now define ourselves and talk to each other more than ever. The last text of this truly thought-provoking book is written by The Standardistas and it is about something that probably should be said again and again – creating for the web isn’t just about how tos and functions, we need to put our work into much wider context. They suggest doing three things: Reading, Conversation and Writing. Reading is meant to broaden our perspective so they recommend books from the fields of psychology, semiotics*, ethnology, anthropology and design thinking in general. * eg. Mythologies by Roland Barthes, great and interesting reading about the meaning of language. I especially enjoyed the first half of the book with short essays on very real life topics from the semiotics point of view. Conversation is something that helps shape ones opinions and understanding of the subject and it leads to new ideas. But I guess it would be worth it to mention that such conversation needs to be done with an open mind on both sides. Writing is described as being able to “explain, convince and inspire”. As a huge bonus every text is followed by a lesson, something each of these fine folks learnt in real life. Essentially it seems like a push to have your eyes open and search for these lessons in your own experience. I think these lessons are often hard to identify because each person can learn something completely different from a very similar situation. Needless to say, I loved this book. It’s a beautiful object with great content. You can get The Manual 1 & 2 here. There are two things that recently made me think about how I do stuff. The first one is about some dangerous routines and over-consumption of information. 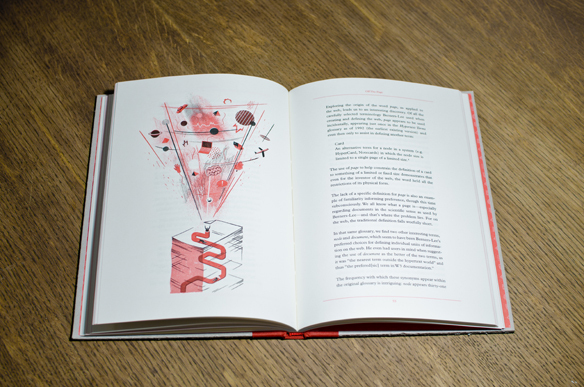 The second one introduces some useful routines and relates to consumption in a creative way. The first thing is an article by David Tate – The Dangerous Effects of Reading. I think more appropriate name would be “The Dangerous Effects of Reading ALL THE TIME”. If the world overwhelms you with its constant production of useless crap which you filter more and more to things that only interest you can I calmly suggest that you just create things that you like and cut out the rest of the world as a middle-man to your happiness?